Q: When you know if you're working too much with Seaside? It seems that my benchmarking "initiative" caused some effects, and many vendors/frameworks are doing the test with the same tool. Considering all of us are using the same tool I've choosen (WAPT), we should define a clear and unique test suite, upload it to a public place, and run it against the different implementations. The results published by AIDA and Cincom have a significant difference between them. Anyway is important that we put "benchmarking" over the table. See you in Smalltalks 2007. Yesterday I ran some benchmark tests against Seaside on Dolphin, Squeak and VW. The test is basically a brute force conection initiation, against the basic Seaside Counter. I won't do any analysis or conclusion yet, just some observations, however I'm publishing the results for you our own review. All the test were ran by separate in the same machine, an Athlon64 X2 3600+, 1GB RAM, Windows XP Pro. Simulating 20 concurrent users starting connections against the server, one after the other, to see how much load it can handle. Dolphin stopped answering connections when they reached the 8000, however, during the test, the image (a workspace) was still responsive (slow, but usable). Once the test ended, the image was responsive again, having more than 8000 instances of WASession, invoking a garbage collect with all those sessions in memory (with all its continuations, i.e. processes), caused a failure, and Windows showed a message saying "Dolphin Smalltalk stop responding". Why it happens at that moment, is unknown to me. The result for Squeak are similar as Dolphin. Same number of instances (average), with the difference of no having "processes" for its continuations, during the test the workspace wasn't responsive as Dolphin's one, but you can evaluate some expressions, and with patience get the print-it or do-it. But passed the test without dying. Invoking a GC forced me to interrupt the VM, because the GC blocked it. VW started answer a large number of hit per second, which was as expected considering its fast VM, but started to halve its performance, and in less than 2 minutes started to show "Process Emergency" (or something similar I don't remember exactly). During the test all the windows were a dark grey rectangle, so no interaction can be done. After two minutes of test, the VM showed a out of memory message, and died abruptly. I've just downgraded my workstation from Vista Business to XP Professional. New release, which uses the newer version of IDB DateAndTime and Duration and fixes a wrong link for the icons. Spurred by the latest addition to the Dolphin autocompleter done by Udo Schneider, I added some icons to the Seaside and Scriptaculous classes, this way will be easier to identify them (apart from its class prefix), and it will be nicer, as Dolphin itself is (well... Dolphin isn't nicer, it's definitely the nicest). I'll publish this modification in the next release. self loop notNil ifTrue: [self loop terminate]. "longer description is below method"
do: [:ex | self loop: nil ]]. Being almost midnight it remembers me a fantastic goal in extended time. Thanks to Sebastián Calvo (aka Gallego) by working together with me to solve this until this late, after all he is talented to solve this kind of stuff. Hat tip gallego! One more reason to keep using Windows XP (or leave Vista). Some minutes ago I installed the recently released version in a notebook to keep working (or playing) during the weekend. After installation I accessed the examples, and to my own surprise, it runs much more fast! But not 2x or 3x, it's about one order of magnitude. I thought it was because of the CPU being Intel (Thinkpad T60, Centrino Duo), because my computer at work is an Athlon64 X2 3600+, so I tested it in my home computer (Athlon64 X2 4000+), but it still was 10 times faster than my computer at work. And guess what... both the Thinkpad and my home computer have XP Pro, whereas my workstation has Vista Business. 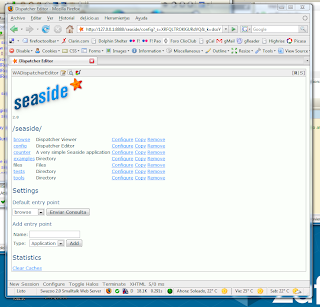 For those waiting to test the latest version of Seaside on Dolphin, it can be downloaded from http://emaringolo.users.dolphinmap.net/seaside/downloads/Seaside-2.8a1-eam.528_c.zip. The ZIP includes the packages (.pac) and the project editions exports for those using STS (recommended). It's not ready for production, because it still leaves dangling processes around until the handlers are cleared. I must fix it, so if nobody does it first, I'll will. However it can be used for development (we will), so I'll be releasing small fixes from now on. Feel free to add comments here, or send suggestions, bug reports, fixes or flames by email to eMaringolo at gmail dot com. my previous post, so we are one step back. However, I'll be releasing a beta version today. A stated in other Smalltalk blog, less is more. And that was the case with the suspended processes left when running Seaside on Dolphin, to fix it I had to "remove" code, not to add. Removing one method send in Continuation>>#value:, everything started to work as expected. 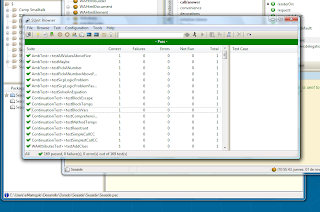 The only thing remaining is the reference to some dead processes of Swazoo (HTTPConnection>>#interact) by some handlers of Seaside, once done, Seaside on Dolphin will rock! I've been running some benchmarks against Seaside on Dolphin. I must say it runs very well, with an good page/sec rate for business apps. Anyway it can't handle being "slashdotted". However, there is a severe problem with something leaving dangling processes in suspended or dead state, which collapses the image after 4 minutes of brute requests (above 8000 requests one after the other), generating a similar number of processes (think of it, 8000 processes!!!!). Something smells near the Continuation implementation. Once solved the request rate should rise. Even with that "little" problem, the performance is a little better than the Squeak implementation (15% faster). And of course, it's running on Dolphin X6. The web based browser doesn't work, I'll will try to fix it, however it's not prioritary.